In 2018, FLVS is introducing a new 48-course elementary curriculum that includes English Language Arts, Math, Science, Social Studies, Spanish, Art, and Technology. From Kindergarten through 5th grade, all these courses have a few things in common: they’re hands-on, empowering, and designed with elementary students in mind. Each course incorporates activities students can do in their own home, encourages them to use their personal experiences to power their learning, and includes plenty of teacher time to support individual students. It doesn’t get more personal than that. Virtual education is tried and true for middle grades through higher education, but for elementary, it can be a bit more challenging. Students are younger, attention spans are shorter, and academic learning is brand new. These challenges inspired the team to create a unique learning experience for these young learners. The best part of a virtual elementary program is that it allows students to have experiences they would never have in a physical classroom. “Our courses are built for dialogue, empowering students to take ownership of their learning. Every lesson has a hands-on or off-screen activity,” says Jaimi Gruler, Senior Manager of Elementary Products. These hands-on activities ensure that students are making real-life connections as they learn. Sample offline activities include an Interactive Notebook, reflections, collaborations, practice labs, activity sheets, nature walks, and sharing with a friend or family member. When students are working online, directions are clear, designs are fun, and learning is interactive. Courses are broken up into modules, lessons and pages, with students learning subjects in a variety of ways. A typical lesson includes bright, colorful photographs and illustrations, game-like activities for practice, videos, storybooks, activity sheets, and either a quiz or assignment. Offline opportunities ask students to “Try,” “Think,” “Write,” or “Share” an activity with a friend or family member. These components are what make these courses so personal. Students can complete lessons following their own schedule, reflect on their own experiences to connect their learning, choose their own topics or materials for activities, and participate in online live lessons called “Class Time” with other students. 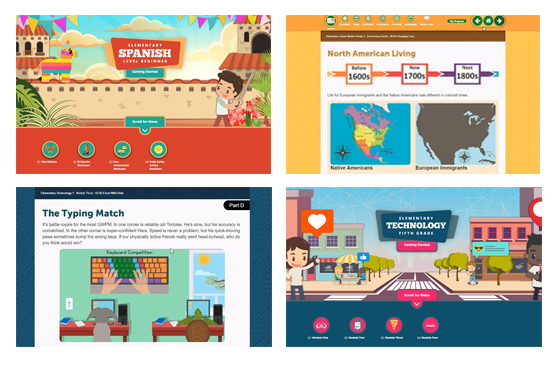 Custom activities were built specifically for our FLVS elementary courses to feel game-like, and fun storylines guide them through each module. In Spanish, students journey to a different country. In Science, they become an inventor in a toy factory. In Art, they go inside paintings to learn techniques. Throughout the courses, different characters guide students through their learning, making the experience feel more personal. A virtual elementary school is new, different, and unlike any school in the real world. That’s because in a virtual classroom, students can journey with an astronaut to see the stars in one module, and travel on safari to Africa in another. They can learn about plant structures, build a model at home, and go on a nature walk to find examples in their own environment. They can learn about erosion while at the beach. The opportunities are limitless. Below is an overview of each of the Elementary subject areas. Focused on introductory reading skills and comprehension, the ELA courses include the five essential components of reading: phonemic awareness, phonics, comprehension, vocabulary and fluency. Students will read informative and literary texts, practice writing, grammar, and speaking and listening skills. Each grade level explores a different, adventure-filled theme to keep students curious and engaged! Critical thinking and problem solving are two skills taught throughout Elementary Math. Rather than leaving students to ask, “When will I use this?”, key concepts are taught with real-world applications so connections are made early on. Songs, rhymes, videos, storybooks, and audio are used to teach and practice math skills in a fun and engaging way. Kindergarten-Grade 2 focuses on building a strong number sense, addition and subtraction within 20, place value, measurement and shapes. Grades 3-5 introduce multiplication and division within 100, fractions, decimals, shapes, area, and volume. Students taking our Elementary Science courses will explore Earth, Life, and Physical Sciences through problem solving, experimentation, creating models, analyzing and interpreting data, engineering, and more! Following the 5E Instructional Model, students will engage, explore, explain, elaborate, and evaluate as they learn. We’ll build on their curiosity by teaching them to ask questions and search for evidence to learn about the world around them. Our Social Studies courses takes a personal approach to introducing students to community and citizenship. They’ll learn important concepts and skills related to history, geography, and economics including their role as a citizen in their home, school, and community. Students will go back in time and learn about the foundation of American citizenship, journey to regions within the United States, Canada, Mexico and the Caribbean Islands, and dive deep into the history of the state in which they live. Elementary Spanish introduces students to both the Spanish culture and language. Each lesson is taught through diverse stories that give students the opportunity to see and hear Spanish in an authentic and fun context. Activities include hearing, speaking, reading, writing, and recording the language to reinforce learning. Course Progression: FLVS offers a total of six online elementary Spanish courses, allowing students to progress through distinct levels – starting with Introductory Spanish and continuing through Levels 1-5. Students will be introduced to Spanish letters, pronunciation, and vocabulary. In more advanced levels, they will develop their grammar and writing skills. After a pretest and discussion with the teacher, students may advance to a higher level if they already have an existing level of Spanish proficiency. Students will be jumping, dancing, swimming, throwing, catching, kicking, tumbling, and more in our elementary PE courses! Students will learn about healthy lifestyle habits, teamwork, sportsmanship, goal setting, and strive for 60 minutes of daily activity. They’ll learn new skills to keep them moving with each grade level! Elementary Art encourages students in every lesson to feel confident in their own creativity and expression. Using the Elements of Art and Principles of Design, students will learn real art techniques through modeling and connect them to master artists. Students will develop their observational skills as they learn how to critique art while making cultural connections with works from around the world. Students taking our Elementary Technology courses will learn basic computer science skills, keyboarding, programming, and coding. Each of these skills is taught alongside meaningful technology topics such as tech safety, digital citizenship, bullying/cyberbullying, adaptive technology, social media, and robotics. 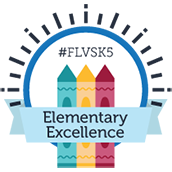 Learn more about the FLVS Elementary Program and enroll today! This entry was posted in Full Time Edition, Homeschool Edition, Parent Edition and tagged Elementary Curriculum, Elementary Homeschool Curriculum, Elementary Subjects, Elementary Virtual School, FLVS Curriculum, FLVS Elementary, FLVS Flex Elementary, Free Online Elementary Curriculum, Grades K-5, Kindergarten Online, Online Elementary, Online Elementary Classes, Online Elementary Courses, Online Elementary Homeschool, Online Elementary School, Online K-5, Virtual Elementary School on June 12, 2018 by Guest Blogger. Is this a full time school program? Hi Veronica! 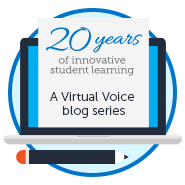 This year, FLVS is offering several ways for elementary students to experience the benefits of online learning! For families interested in a more traditional educational experience following a fixed school year calendar with weekly live instruction during interactive Class Time sessions, students may take multiple courses together with a group of classmates and one core teacher through FLVS Full Time OR FLVS Flex. For families interested in taking one or more courses following their own schedule, Flex elementary courses are now available with year-round rolling enrollment. Learn more at http://www.flvs.net/options. How many hours per day/week does a student have to work on assignments? My daughter is going to 4th grade. Hi there! The schedule will depend on the specific course and learning experience you choose. If you are following the regular school year with FLVS Full Time (or FLVS Flex), each student will need to dedicate time for each subject to complete the lessons and assignments for that week. When taking individual subjects through FLVS Flex, the schedule is a bit more flexible. You can work with your teacher to create a custom schedule that works for you, typically requiring some form of progress (for example, one lesson) each week. Each course is broken down into modules with individual lessons that consist of 5 parts. At the end of each lesson, students complete an activity, assignment, or assessment to demonstrate learning. Check out these links for more information! So excited!! I had wondered if parents were going to receive this information in the mail or online. Thank you for posting! Hi Pam. The courses will be officially launched in August 2018, so unfortunately they will not be available this summer – but they will be an option for summer 2019! When will returning students / coaches be notified? We submitted our intent to return but want to make sure we have time to go over it and make the right choice. Hi, I may sound silly; however, I am a 60 year old grandmother homeschooling my granddaughter who is 8. Can you tell me the when is the first day of flvs flex school? I am wanting to be prepared ahead of time. I saw the course have been verified but not assigned yet. Thanks. Hi Lena! School starts on August 13, so your granddaughter will be placed in her courses at this time. We hope she’s excited for the start of the school year! I am a first time homeschool parent! I am excited and nervous about this new engagement but everyone at FLVS has been extremely helpful with guidance and answering my questions. The Flex program will afford us the flexibility we need and still learn! Ready for August 13! If my daughter does all her courses using flex under an umbrella school, she can recieve her diploma? It’s confusing because I read FLVS FLEX doesn’t receive a diploma but FLVS Fulltime does. My son is in 5th grade and he would like to take Spanish as a flex FLVS course. Would he need to start at the introduction level? If so, how long are each of the sessions and will he be able to complete through the 5th grade session by the time he enters 6th grade? I’m looking to do math for my 3rd and 4th graders through FLVS flex, because they have practice during the day they wouldn’t be able to make the “live” classes. What are the alternatives to the live class? Hi Ester! The live Class Time sessions are recorded so your students can watch at their convenience. While Class Time is recommended as a great way to interact and engage with teachers and peers, only two sessions are required to be attended live for credit. If my student transfers to Flex Elementary after finishing the first semester in a traditional classroom successfully, will he receive credit for that semester or will he have to start again at the beginning? Hi there! Yes, if your student has finished the first semester, they can sign up for the second semester (“Segment 2”) of their courses with FLVS Flex. How does flex work with traditional school? What would my son do during math instruction each day, if he he is taking math through flvs flex? Can he get on the computer in the classroom and work on his flex course? Can he still go to traditional school for the entire day? I am not happy with the manner the school system approaches math and I am considering signing my son up for that one class. Hi Michelle! If you would like your son to continue to attend his traditional school, this is something you can discuss with the administration and/or counselors at your current school. They can discuss your options and whether it’s possible for him to participate in an online course while he’s at school (perhaps in a computer lab setting) or to take an online class from home to supplement his other studies. My grandson is 3rd grade level on a K1 reading level..and 3rd grade for math. Can he be enrolled in a lower grade than he actually is.. and then math a different level? Hi Tammy! It is possible to sign up for different grade levels by subject based on your child’s academic needs. Give our elementary team a call at 407-513-3604 and they will be happy to provide more information specific to your needs.